If you have trees surrounding your home or roof capture area, then leaves will no doubt fall or be blown onto there. When it rains, water washes these leaves, as well as sticks, insects and other matter into gutters and downpipes. Unless guarded against, such matter will wash into the pipework and potentially end up in your tank. This article explores the benefits of rain heads and how they work to filter out contaminants, making them a valuable accessory to include in your rainwater tank installation. What is a Rain Head? Rain heads (also known as “Leaf Eaters”) are a head piece designed to fit at the top of vertical PVC piping. The rain head forms the screened entry point to the top of pipework that leads water into your tank. The rain head at the top of this pipework is therefore normally used below an open downpipe from your gutter. As water flows onto the head piece, leaves, sticks, insects and the like are deflected allowing only fresh rainwater to pass through. Higher Quality Tank Water: An obvious benefit is that water in your tank will be of a higher quality. This is especially important if you wish to use your rainwater as a potable water supply, in cooking, drinking or watering stock. 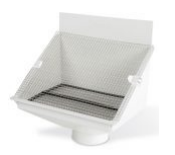 First-Level Filtration: Mesh screens on rain heads come with an aperture size of less than 1mm. This means that while they mainly guard against leaves they also work to prevent mosquitoes, insects, vermin and smaller debris from entering your rainwater pipework. This is especially important if your pipework runs underground (in a “wet system” setup), which is prone to sediment build-up. Cost-Effective & Time-Efficient: Screening water at the entry point to your pipework is a simple and low-cost way to keep leaves and debris out of your water. Gutter guards, which are mesh screens attached to the top of gutters, will also work to keep out leaves and debris. Yet, many aren’t as effective and would be much more expensive and time-consuming to implement compared to rain heads (read more here about on rain heads versus gutter guards). Reduced Tank Maintenance: Every 2-3 years, you should be inspected your water storage tank for sludge build-up which will need pumping out periodically (see How to Clean Sludge Out of Your Water Tank). Since rain heads filter debris out from your rainwater, this mean you won’t need to clean your tank as regularly. In summary, installing rain heads are a simple, inexpensive and effective method to screen your rainwater before it even enters your pipework system. The enormous benefit they bring makes them a valuable addition to have with any rainwater tank purchase. Team Poly supply high-quality rain heads made to fit rainwater harvesting pipework. There are many different kinds available, so if you are interested in one for your rainwater harvesting system, contact us today.